In this lesson, we will learn how to distinguish between prime and composite numbers, identify prime numbers, and find the prime factors of a number. 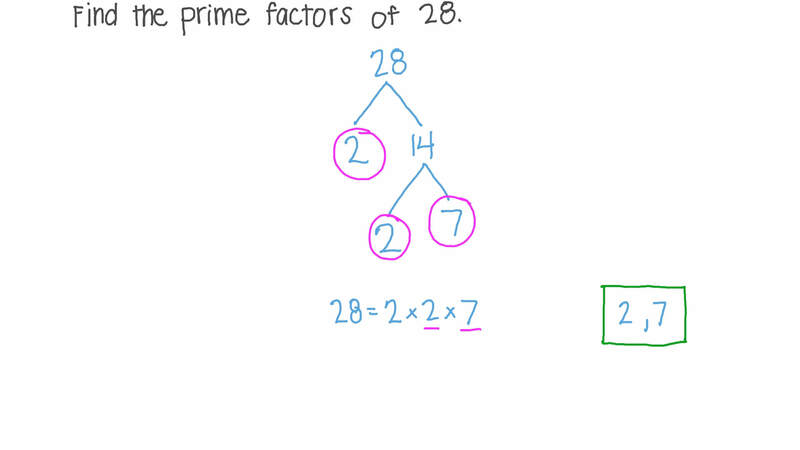 Find the prime factors of 28. What is the smallest composite number between 31 and 37? There are 47 people in a graduation ceremony. List all the factors of 47, and state what type of number it is. Dina has found that . Is 91 a prime or a composite number? Write 46 as a product of primes. Are 2 , 3 the prime factors of 18 without repetition? How many prime factors does 76 have without repetition? A book consists of 483 pages. Write this number as a product of prime numbers. Which of the numbers 22, 67, 21, 36, 48, and 8 has a prime factorization of exactly two factors? Which of the following is the prime factorization of 10? Which of the following is the prime factorization of 49? I am an odd number between 40 and 54. I have exactly one prime factor that is not me. What number am I? Find the smallest number whose prime factors are 3, 5, and 7. Which of the following is the prime factorization of 18? Write the prime factorization of 392 in exponent form. Write the prime factorization of 28 in exponent form. Find the number whose prime factors are 5 and 7. Find the missing number in the given Venn diagram. Find the prime number where the sum of the factors is 84. Find the prime number where the difference of the factors is 40. Find the two numbers where 11, 3, 5, and 11 are the prime factors of the first number and 2, 17, 17, and 5 are the prime factors of the second number. AThe first number is 1 815 and the second number is 2 890. BThe first number is 224 and the second number is 418. CThe first number is 1 826 and the second number is 2 895. DThe first number is 165 and the second number is 578. Venn diagrams can describe prime factors. Find the missing number in this Venn Diagram. Find the missing numbers in the given Venn diagram before answering the following questions. Find the greatest common factor of 35 and 55. Find the least common multiple of 35 and 55. Venn diagrams are useful for finding the greatest common factor and the least common multiple of two numbers. Write 30 as a product of its prime factors. Write 75 as a product of its prime factors. Which of the following diagrams displays a correct Venn diagram? Venn diagrams are used to find the greatest common factor and the least common multiple of two numbers. Write 18 as a product of its prime factors. Write 60 as a product of its prime factors.